Zimecterin Gold (Merial) is the first equine dewormer licensed in the U.S. for the control of equine tapeworms. Also removes Roundworms and Bots. Compare our price of 12 or more at $11.95 each, plus the $6.00 rebate from the manu. for every 4 tubes and Free Shipping. 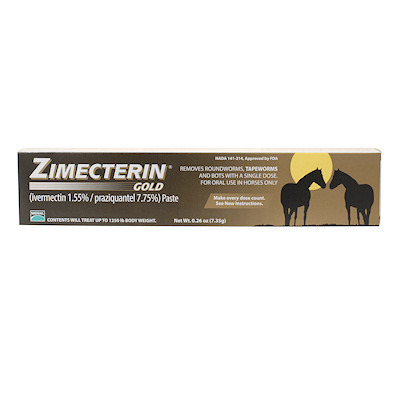 Zimecterin Gold combines ivermectin (1.55%) and praziquantel (7.75%) to provide the broadest spectrum of parasite control available for horses. Praziquantel is proven to have a wide margin of safety and to be highly effective for controlling tapeworms in horses. Zimecterin Gold may be used on foals two months of age and older. One tube treats up to 1,250lbs. body weight.